This article reviews a range of literature of computer games and learning theories and attempts to establish a link between them by proposing a typology of games which we use as a new usability measure for the development of guidelines for game-based learning. First, we examine game literature in order to understand the key elements that constitute games. This is then followed by the theoretical discussion of the relationship between the game components and the learning theories, namely behaviourism, cognitive constructivism, and social constructivism. Ten games are analysed using the learning theories and a typology of game is proposed that classifies games into four major categories. Then based on these findings we developed a set of guidelines for game-based learning using Human Computer Interaction (HCI) methods. Ang, C.S., Avni, E. & Zaphiris, P. (2008). Linking Pedagogical Theory of Computer Games to Their Usability. 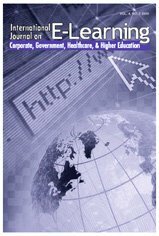 International Journal on E-Learning, 7 (3), 533-558. Waynesville, NC USA: Association for the Advancement of Computing in Education (AACE). Retrieved April 25, 2019 from https://www.learntechlib.org/primary/p/24229/. Aarseth, E. (2003). Playing research: Methodological approaches to game analysis. Paper presented at the Digital Art and Culture Conference, Melbourne, VIC, Australia. Apple Computer. (1992). Macintosh human interface guidelines. Reading, MA: Addison-Wesley. Ardito, C., Marsico, M.D., Lanzilotti, R., Levialdi, S., Rosellit, T., Rossano, V., et al. (2004). Usability of e-learning tools. Paper presented at the International Conference on Advanced Visual Interface 2004, Gallipoli, Italy. Boden, M.A. (1979). Piaget. London: Fontana press. Burton, R.R., & Brown, J. (1979). An investigation of computer coaching for informal learning activities. International Journal of Man-Machine Studies, 11, 5-24. Cyan Worlds. (1993). Myst. Retrieved February 25, 2008, from http://www.mystworlds.com/us/Davis, J.P., Steury, K., & Pagulayan, R. (2005). A survey method for assessing perceptions of a game: The consumer playtest in game design. The International Journal of Computer Game Research, 5(1). Desurvire, H., Caplan, M., & Toth, J. A. (2004, April). Using heuristics to improve the playability of games. Paper presented at the CHI Conference, Vienna, Austria. Dyck, J., Pinelle, D., Brown, B., & Gutwin, C. (2003, June). Learning from games: HCI design innovations in entertainment software. Paper presented at the Graphics Interface Conference, Halifax, NS, Canada. Frasca, G. (1999). Ludology meets narratology: Similitude and differences between (video) games and narrative. Retrieved April 24 , 2008, from http://www.ludology.org/articles/ludology.htm Gee, J. (1999). An introduction to discourse analysis: Theory and method. New York: Routledge. Gee, J. P. (2003). What video games have to teach us about learning and literacy. New York: Palgrave Macmillan. Jenkins, H. (2002). Game design as narrative architecture. In P. Harrington & N. Frup-Waldrop (Eds. ), First person. Cambridge, MA: MIT Press. Juul, J. (2001). A clash between game and narrative. Unpublished master's thesis University of Copenhagen, Copenhagen,Denmark. Juul, J. (2002, June). The open and the closed: Game of emergence and games of progression. Paper presented at the Computer Game and Digial Cultures Conference, Tampere, Finland. Tampere, Finland: Tampere University Press. Juul, J. (2003, November). The game, the player, the world: Looking for a heart of gameness. Paper presented at the Level Up: Digital Games Research Conference, Utrecht, The Netherlands. Kaur, S., & Yusof, R. J. R. (2002, September). Guidelines for designing a usable educational system. Paper presented at the IEEE International Conference on Advanced Learning Technologies, ICALT2002, Kazan, Tatarstan, Russia. Lindley, C. A. (2002, June). The gameplay gestalt, narrative, and interactive storytelling. Paper presented at the Computer Games and Digital Cultures Conference, Tampere, Finland. Malone, T., & Levin, J. (1984). Microcomputers in education: Cognitive and social design principles. In D.F. Walker & R.D. Hess. (Eds. ), Instructional software - principles and perspective for design and use. Belmont, CA: Wadsworth Publishing. Malone, T. W. (1980, September). What makes things fun to learn? Heuristics for designing instructional computer games. Paper presented at the 3rd ACM SIGSMALL symposium and the 1st SIGPC symposium on Small systems, Palo Alto, CA. McMahon, M. (1997, April). Social constructivism and the world wide web – A paradigm for learning. Paper presented at the Ascilite Conference 1997, Perth, WA, Australia. Molich, R., & Nielsen, J. (1990). Improving a human-computer dialogue. Communications of the ACM, 33(3), 338-348. Nielsen, J. (1994, April). Enhancing the explanatory power of usability heuristics. Paper presented at the ACM CHI'94 Conference, Boston, MA. Pac-Man. (1980). Paddison, C., & Englefield, P. (2003, November). Applying heuristics to perform a rigorous accessibility inspection in a commercial context. Paper presented at the CUU 03, Vancouver, BC, Canada. Rieber, L. P. (1996). Seriously considering play: Designing interactive learning environments based on the blending of microworlds, simulations, and games. Educational Technology Research and Development, 44(2), 43-58. Rieber, L. P. (2000). Computer, graphics, and learning. Madison, WI: Brown & Benchmark. Rockstar North. (2004). Grand theft auto: San Andreas. Retrieved June 12 , 2007, from http://www.rockstargames.com/sanandreas/Ryan, M.-L.
Ryan, M.-L. (2001). Beyond myth and metaphor – The case of narrative in digital media. The International Journal of Computer Game Research, 1(1). Shneiderman, B. (1992). Designing the user interface: Strategies for effective human-computer interaction, (2nd ed.). Reading, MA: Addison-Wesley. Sony. (1999). Everquest. Retrieved June 11, 2007, from http://everquest.station.sony.com/Spacewar! (1962). Squire, K. (2003). Video games in education. International Journal of Intelligent Simulations and Gaming, 2(1). Super Mario Brothers 3. (1988). In wikipedia, the free encyclopedia. Retrieved February 25, 2008, from http://en.wikipedia.org/wiki/Super_Mario_Bros Tetr is. (1985). Valve Software. (1999). Counter strike. Retrieved June 11, 2007, from http://half-life2.com/Vygotsky, L. (1930). Mind and society. Cambridge, MA: Harvard University Press.